How much data does Skype video use? For those of us who are constraint with limited bandwidth, you will realize that video takes up a lot of bandwidth. I’ve been doing tests on various video websites (youtube, Vimeo, BBC and CNN). I also measure Skype video as well since most of us (especially those living aboard) Skype is a great tool to connect with our friends and family. I use NetLimiter to measure how much data Skype video is using on a 1 hr 9 min conversation (that’s 69 minutes). In this conversation, 24.67 mb is download and 696.47 mb is upload. The total data used is 721.14 mb. 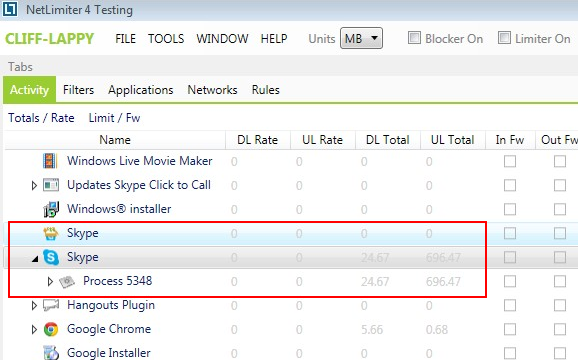 This means that Skype video is using 10.45 mb/minute. As you can see, the amount of upload is many times moer than download. When I was on Skype video, the data upload rate is about 0.20 mb/sec. What this means is that if you want to reduce your data usage, consider disabling your web cam when you Skype. What about just audio? I haven’t done that yet. But I will keep it in mind to measure next time. Can you upload also the Audio Testing for Skype? Great idea. Let me get to it next time i use Skype for an audio talk. Will let you know when I upload the test. Its 2017, have you gotten around to measuring voice calls only yet? Not yet as I haven’t done any Skype calls. When I am free-er next time, I will run an audio test on Skype and let you know.